Patterns pop out on trading price point-and-figure charts. Some of the most common patterns include support and resistance, but also simple patterns such as double and triple tops and bottoms appear.You can easily apply these common point-and-figure chart patterns. Horizontal support and resistance: In point-and-figure charting, the horizontal line that you draw to mark the top or bottom of columns becomes a kind of recent-history support or resistance. Therefore, you often get a series of columns that all end at a floor or a ceiling, regardless of whether they’re Xs or Os. Floors and ceilings are very handy both for spotting a breakout and setting a stop. 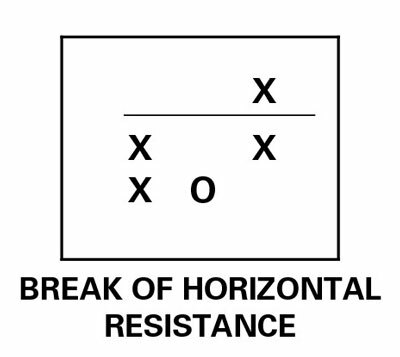 This figure shows a breakout X above the resistance line. Using conventional charting, you wouldn’t have known that line was there unless you were on the lookout for historic highs and lows. But point-and-figure chartists draw them all the time to denote where supply becomes abundant or demand falls short, halting a price rise. 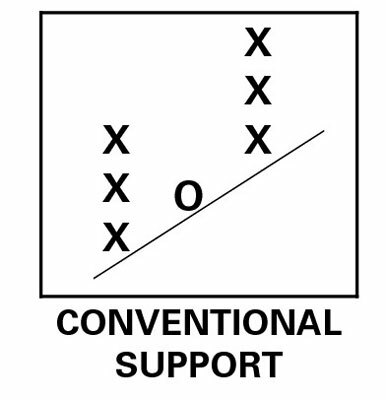 Conventional support and resistance: You trade point-and-figure support and resistance the same as you do when using conventional support and resistance — a breakout to the upside triggers a purchase and a breakout to the downside triggers a sale. Like with conventional support and resistance lines, don’t erase a support line after it’s broken — it has a good chance of becoming the new resistance line. An old resistance line may become the new support line, too. This figure shows a conventional support line. You could have a conventional (sloping) resistance line, too. Double and triple tops are formed when demand falls off as the price nears a previous high. When bulls fail to get a breakout above the established high, it’s a pretty good sign that sellers are happy to unload the security at that price. When you get more than one low at about the same level, it’s a double or triple bottom, where buyers think it’s a bargain, and the price is likely to rise. A double or triple top or bottom can be either a reversal pattern or a continuation pattern in point-and-figure charting, depending on the behavior of the opposite-direction columns. In conventional time-based bar charting, you have to wait for confirmation of these patterns — chewing up time. Point-and-figure, therefore, can speed up the process of helping you decide whether you’re getting a reversal or a continuation. In point-and-figure charting, chartists find that in an uptrend of Xs, if the intervening Os are on a rising line (the lowest low in the last O column isn’t as low as the lowest low in the previous O column), a double top may turn into a triple top and then an upside breakout — in other words, a continuation pattern.